What a thrill, to have such truly fine and diverse Easter chocolates to choose from. It’s that time of year again. The days are getting longer, the detox ought now to be a distant memory, and Christmas is so long ago that you don’t need an excuse to get majorly excited about some celebratory chocolate again. And eggs, chicks and bunnies! Only the hardest of hearts could resist. 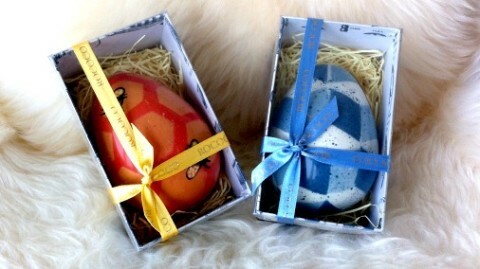 Painted, treat filled eggs from Rococo. 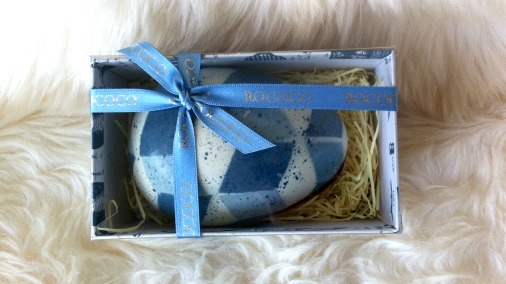 Starting with Rococo, who have made some of the most beautiful eggs I have ever seen. There is an exquisite large hollow egg gloriously painted with blossom that would take anyone’s breath away, and I absolutely adore these two hand painted beauties. Both are filled with goodies, the bee egg with chunks of chocolate covered honeycomb and the blue egg with salted caramel filled mini-eggs. They are both 40% milk chocolate, and given Rococo’s genius with salted caramel the blue egg is on my personal bunny delivery wish list. A very happy nest, from Chococo. Chococo truly know what they are doing with seasonal chocolates, I recommend them to people time and again, as they simply get it right. 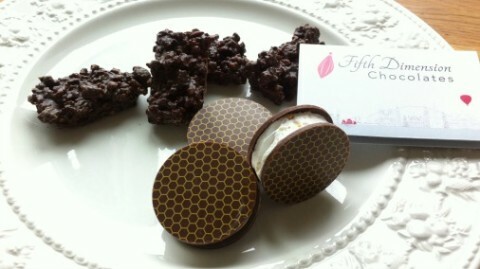 Their shapes are totally charming, their chocolate is wonderfully delicious, and they always have the fun factor. Their large eggs are particularly special, this one opens to reveal a flock of chocolate butterflies. The egg holding a contingent of chocolate dinosaurs has long been a favourite, not just of mine, I imagine they would have an uproar on their hands if they threatened to stop making it. There is truly something for everyone. 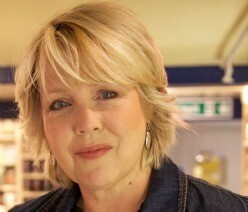 But you will need to act sharpish to order in time for Easter, I know we are getting close to last order dates. 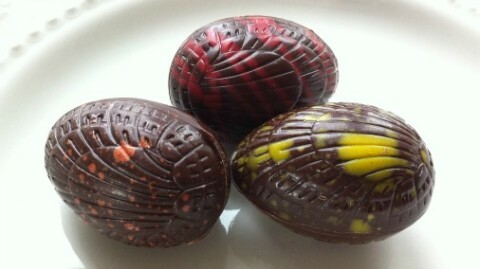 The Winchester Cocoa Company’s small filled eggs. 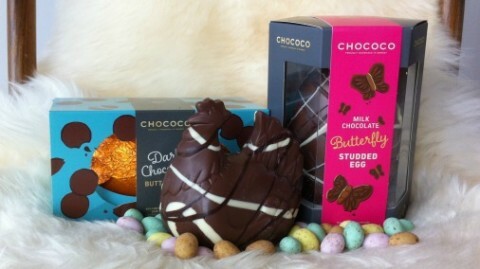 Winchester Cocoa Company have made their filled mini-eggs again this year, and they are special. The pretty fine dark chocolate shells contain fillings bursting with flavour. Passionfruit ganache has a bright hit of the zingy fruit. Strawberry compote and balsamic ganache contains a soft, berry-rich jelly, the balsamic quietly serving to enhance the whole. The Piedmont hazelnut praline is exceptional, fine nuts, darkly toasted, combine wonderfully with the caramel and toast notes in the chocolate. 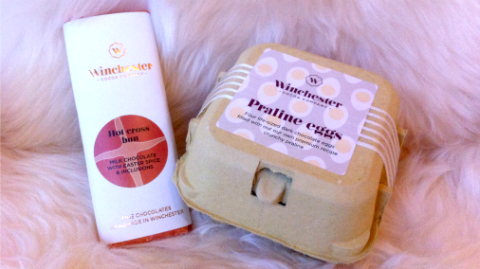 Life-size praline eggs and the hot cross bun bar from Winchester Cocoa Company. Two more things from The Winchester Cocoa Company well worth trying are their Hot Cross Bun bar, and their life sized praline eggs. The hot cross bun bar combines all the fruit and spice you could want, in fine balance with creamy milk chocolate. 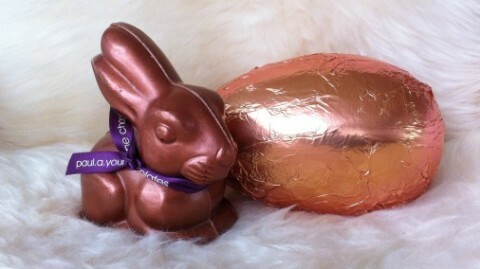 The praline eggs are just more of something utterly wonderful, so why wouldn’t you! Fifth Dimension Chocolates are new to me, so instead of their Easter eggs I wanted to taste some of their signature chocolates, all of which would make great gifts for anyone you felt didn’t need to be given something more overtly themed. Their Journey Box is a trip around the world in chocolates. 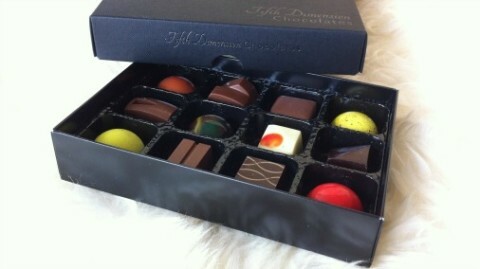 Each chocolate is inspired by a different city, and their visual boldness and diversity is reflected in their flavours. It is a great fun journey to take. My favourites included the Boston – their take on the classic combination of Peanut Butter and Jelly – a good raspberry jam hit and smooth peanut are correctly paired with creamy milk chocolate. I also loved the Hong Kong, a great buttery caramel elegantly seasoned with the tang and earthiness of soy. Chocwich and Salmoran from Fifth Dimension. Two other products from Fifth Dimension are worth seeking out. The Chocwich, a marshmallow chocolate ‘sandwich’, comes in various flavours, and has won them a Great Taste Award. Also award winning is a treat I liked so much I bought more the moment I had finished my bag – Salmoran (I tried orange) is a dried fruit, crunchy almond, dark chocolate combo, that hits every spot. It has a great crunch, fine fruitiness, and more than enough good dark chocolate combining them to satisfy. Be warned, it is incredibly moreish! 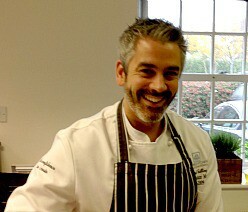 And the cute award goes to…….Paul A Young! Or rather on this occasion his divine bunny. This rabbit is a class act, an utterly charming mould, excellent chocolate, and a very pretty bronzing, finished with his dapper purple necktie. There will be a fight in my house as to who gets him, so I am having him. Or at least that is my excuse. 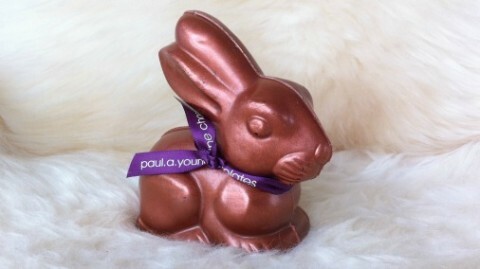 Bunny with his egg friend from Paul A Young. Of course Paul has all his luscious boutiques full of things you will want for Easter, not least this handsome large egg, filled with mini-eggs. 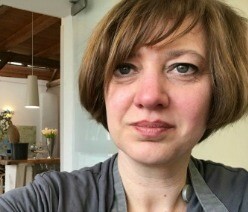 The problem will be what to choose, everything is handmade with loving care, and tempting-beyond-belief chocolate. Whatever you choose, I hope you have a wonderful Easter, and that your Easter bunny is reading this article!